Whether you’re a professional or a newbie racer you’ll hear it around the boatyard or yacht club: “Doin’ Bermuda?” For East Coast sailors, the Newport Bermuda Race (which starts June 20, 2014) and the Marion to Bermuda Cruising Yacht Race (June 19, 2015) seem to be the pinnacle we all aspire to. Maybe it’s the challenge after hearing sea stories – some would say horror stories – or maybe it’s just part of the normal growth cycle of a sailor who takes it seriously, but there certainly is a seemingly well-earned mystique about doing a race to Bermuda. It is a wonderful place to bring your boat, with June temperatures in the 80s and water temps not far behind. So, if this is your year it’s time to get moving! I put Bermuda prep into three categories: shopping, projects, and studying. All three run concurrently and all three will be successful in direct relationship to how early you start; how focused you stay; and how hard you work. Put it all together and it will directly influence your success in the race. There are three categories on your shopping list; the first is “required.” This can be daunting if you do it all at once, especially if the boat has never done the race before. The sooner you start getting the required items, the more you can space out the pain. Biggies on the list include life raft, heavy weather sails, insurance, sat phone, flares, EPIRB, paper charts, radar reflector, AIS and splitter, and manual bilge pumps. The next category is “strongly recommended” which includes, among other things, latches for all drawers and cabinets, floor tie-downs, a Bermuda chip for your GPS, and a tri-color masthead light. The third category comprises the “nice to have” items like high-tech bottom paint, LED bulbs for various lights, an autopilot, foot pumps for fresh water, a new jib top, etc. Make up your own shopping lists with the NOR, SI, and Inspection checklist from your race in hand. The race documents determine what’s on the “required” and “recommended” list. Let your experience and wallet determine what’s on the “nice to have” list. Winter “specials,” warehouse sales, Internet searches, and discounted items can save you money. Some retailers have “VIP buyers clubs” and the like which, if you put up some front money, can save you in the long run or eliminate shipping charges. Start your projects as early as possible; the smallest of projects always takes a lot longer than you would think. Be realistic in deciding what you can do and what has to be done by the boatyard or another professional. Make sure the yard understands that you will need to be in the water well before June. If you’ve covered your boat, make sure there is a “hatch” so you can get in and out for projects like refinishing the bottom, installing new lifelines, latches on drawers and cupboards, clip-on points for harness tethers, etc., or just for measurements. Talk to the measurer if you need a new or adjusted rating certificate. Check your passport, make sure you and your crew have current ISAF classifications, and make sure your state boat registration or federal documentation will be valid for the time of the race. Use the winter months to study the Racing Rules of Sailing (RRS), and the rules of the road (COLREGS). Most races abandon RRS and use COLREGS at night. There are a few differences, and being familiar with them before you get “out there” is good seamanship. Find the weather and Gulfstream (GS) websites that you like and start a routine of downloading GS maps so you have a feel for how movements can be expected during the race. Download the NOR, SI, and Inspection checklists if they’re available, or use those from the last race. Minimize your surprises; sign up for the email notices from the Race Committee. They will be mostly marketing items, but will also have any important changes the RC are planning. Psych yourself for a bureaucratic onslaught that will make the IRS seem like a bunch of rookies! Start a spreadsheet with potential crew and their strengths and weaknesses. Consider carefully and realistically who will be an asset offshore for four to six days. The crew you sail with on a weekend might not be the best choice for being cramped together with, 24/7, in a space barely larger than some closets! 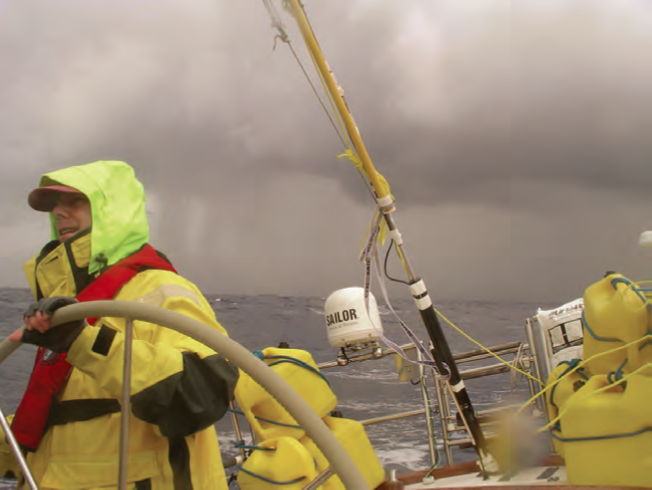 Heavy weather – and maybe more importantly, light weather – can be very frustrating and trying on crew. A person’s ability to stay calm and productive is priceless. If this is your first time offshore, find a strong member of the afterguard whom you like and trust. There will be times offshore when you’ll be very glad to hear a voice of experience say, “We’re OK here, no worries!” If your own experience is on the light side, it’s likely that race organizers will require your navigator and/or watch captains to have a strong resumé. Make arrangements for tying up in Bermuda. Some races go into Hamilton and some go into St Georges. These ports are a too far apart to walk from one to the other, and it’s very expensive to take a cab. Pack a roll of quarters (American currency is OK) for the buses. When you get there, hasten to one of the main bus terminals and buy a bus and ferry pass. You’ll be able to go anywhere on the island and it will make your visit cheaper and more fun. Find out if your cell phone plan covers Bermuda. Some don’t and others are very expensive. Sometimes it’s cheaper to go into one of the cell phone stores on the island and buy a phone and some time, which will be enough for the duration of your stay. If you have crew flying in for the return trip, make sure your standards for selection are as high as for the race. Your potential for running into rough weather is just as great as during the race. Also provide them with a “To whom it may concern” letter stating that they will be departing Bermuda on your boat on whatever date you plan to leave. Bermuda authorities are reluctant to have people arrive on their island without a way off! Make room reservations early. During times of economic slowdown, many smaller hotels shut down or close permanently, putting pressure on those still open. Try to keep as close to the race center as your wallet will allow. Talk to people who have been before and find their favorite places to stay. Use the Internet, but as always, with caution. Here are a few tips, whether you’re a first-timer or an old salt! dealing with this has added lots of sometimes un-needed gear to my sea bag. One thing you can do rather then bringing bulky long pants is to bring “long johns” which can be worn under shorts (I know it looks kinda weird), and wear your foul weather pants over. Similarly, a polypropylene or fleece top combined with a couple polo shirts and your foul weather jacket keeps you pretty warm. Fleece hats or gloves take up less space and dry more rapidly than other choices. Sea boots keep you warmer, even when it’s not wet. Crunchy granola bars are great if it’s too rough to pull off that elaborate plan of baking casseroles! Find out everyone’s favorite non-alcoholic beverage and bring plenty. Bottled water is good for you and politically correct, but sometimes the battered spirit needs a treat! A full stomach is much less likely to be seasick. Speaking of seasickness, treat a fallen crewmate with kindness and respect. They’ll be back in the game sooner than if you treat their condition with derision. Not to mention that it might be your turn next! tiers and provide a great service for a modest charge. Number one tip My number one tip is to take it all very seriously. It can be a hostile environment out there. That said, have fun! I could tell you that you’ll see whales, or dolphins, or birds, and I might guess right, but every year it’s different! Whether it’s wildlife, features of the water or sky, or strange lights…I can’t say. I can tell you that you will see something that you will find truly amazing! It’ll turn you into an offshore sailor, maybe permanently. Keep your checkbook handy! 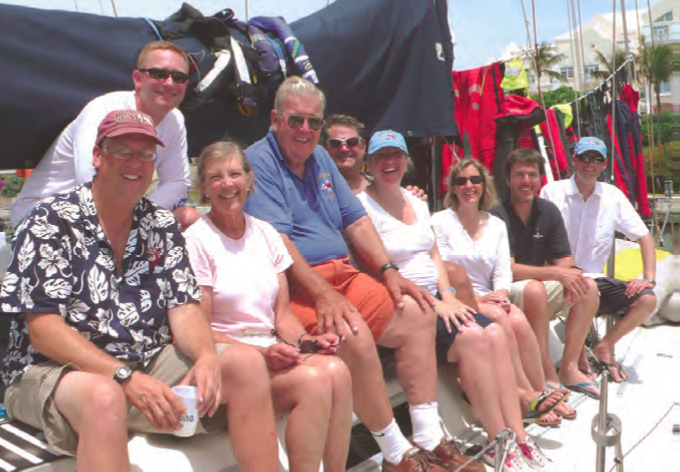 A sailor since the 1970s, Ernie Messer is a member of the Cruising Club of America, Off Soundings Club and Shennecossett Yacht Club. He and his wife have sailed New England for many years and have also raced to Bermuda frequently, including three times doublehanded! They sailed for 15 years on their Tartan 41 and now sail on a restored Peterson One-Ton, Valour, out of Westbrook, CT.